Figure 1 shows a layout of the project. The satellite link, and associated server equipment is housed in Bunda electricity substation. 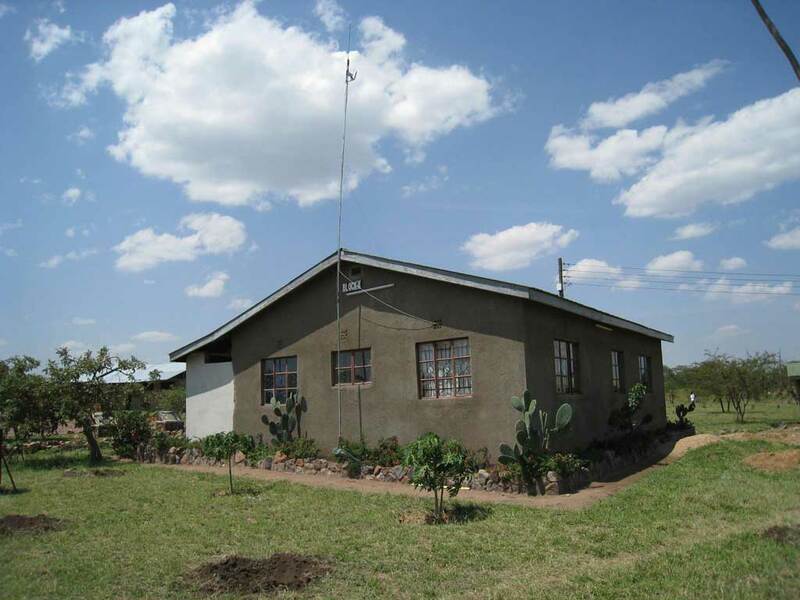 This is a good dual use of infrastructure, as the substation provides a secure and air-conditioned environment for the ICT equipment, as well as a reliable source of power. 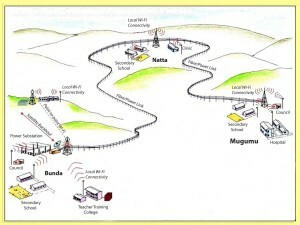 The Internet connection is transported 150 kms to Mugumu via Natta through the use of a fibre optic cable running above the electricity cables. Again this is a good dual use of infrastructure with the electricity poles being used for two purposes, and the copper shielded fibre acting as lightning protection for the electricity cables. The internet access is delivered from Wi-Fi (Wireless network con- nectivity) hubs located along the cable, to the schools, hospitals and council offices. Wi-Fi is a good choice as it is quick and easy to deploy, requires no cables to be run to the buildings, is readily available and low cost. Also, if focused in a point to point beam, it can transmit over long distances of several miles. Figure 2 shows the Wi-Fi aerial located in the teachers office at Natta Secondary School. As can be seen, it is a simple technology making it easy to install and maintain. The potential benefits the internet can bring to these locations are already being seen in the schools connected. The Headmaster in Natta secondary school advised that the teachers are able to research lessons using up to date subject matter, or teach on subjects which before they could not as they had no suitable text books. They are also looking at remote learning possibilities for teachers, allowing them to continue their professional development without having to leave Natta. This could help alleviate the issue of teachers only staying short periods at remote schools due to returning to university. Bunda Teacher Training College has seen monthly evaluation exam results improve, and better quality material prepared for lessons. The number of scholarships and placements achieved by the trainee teachers has also gone up. Further work is required to help the other schools, and hospitals make use of the computers and internet, but once a few are using it productively, it should help spread the benefits. The advantage Tanzania has, along with other countries in a similar position, is that they can make a technology leap to the latest appropriate technology without making incumbent infrastructure redundant. Access to information and the ability to communicate is key to improving society, services and businesses.